Pair of 18k gold drop earrings by Bvlgari, decorated with pink tourmaline cabochons and approx. 0.90ctw in G/VS diamonds. Earrings are 52mm long and weigh 26.3 grams. Marked: Bvlgari, 750, 2337AL, BA15130. 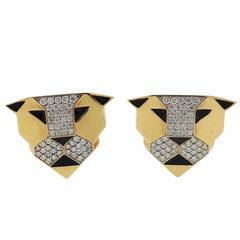 A pair of 18k gold earrings set with 1.19ctw of G/VS diamonds. The earrings are 21mm x 25mm and weigh 24.7 grams. Marked: Enigma, made in Italy, 750. The retail is $9300. A fabulous pair of vintage Bulgari drop clip-on earrings crafted in 18k yellow gold. 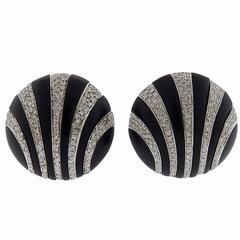 The earrings measure 1" in length.